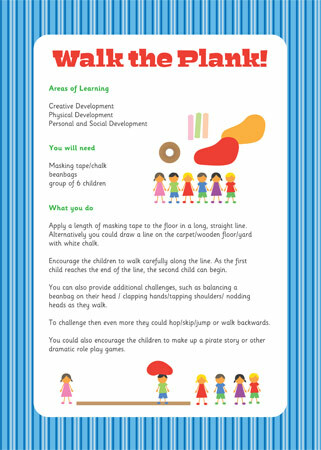 A fun drama/PE activity to help improve physical development. Draw a line along the floor (or use masking tape) and ask the children to walk along it without falling in the ‘sea’ (anything outside of the line). Make this more challenging by asking them to carrying a beanbag on their head or hop along the line. so excited to be signed up! Always need good ideas to keep the children learning.